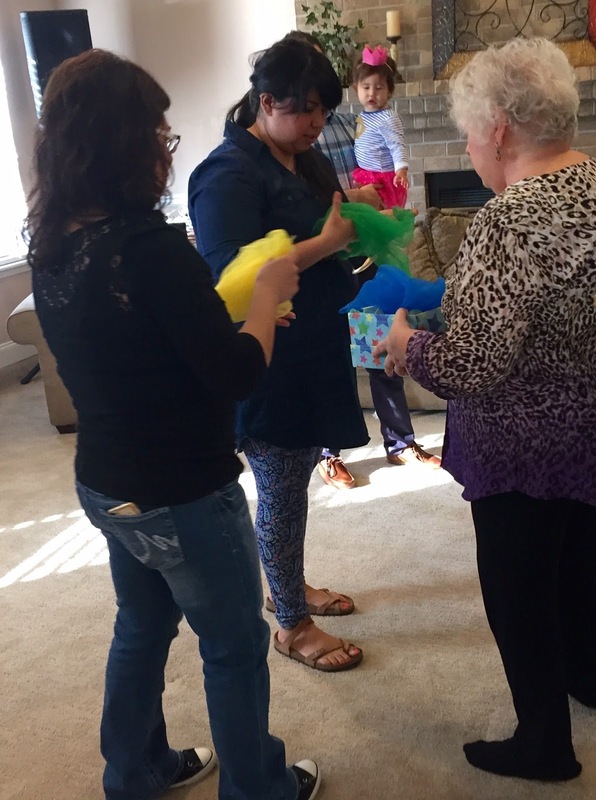 Looking for something fun and educational in Abilene, Texas? Have you often wanted something fun to do with your little ones? Something simple, non-threatening, but educational? 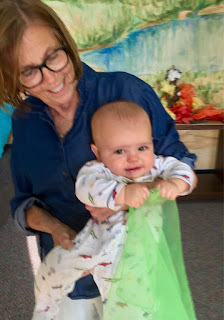 We deliberately play and learn with babies every week! 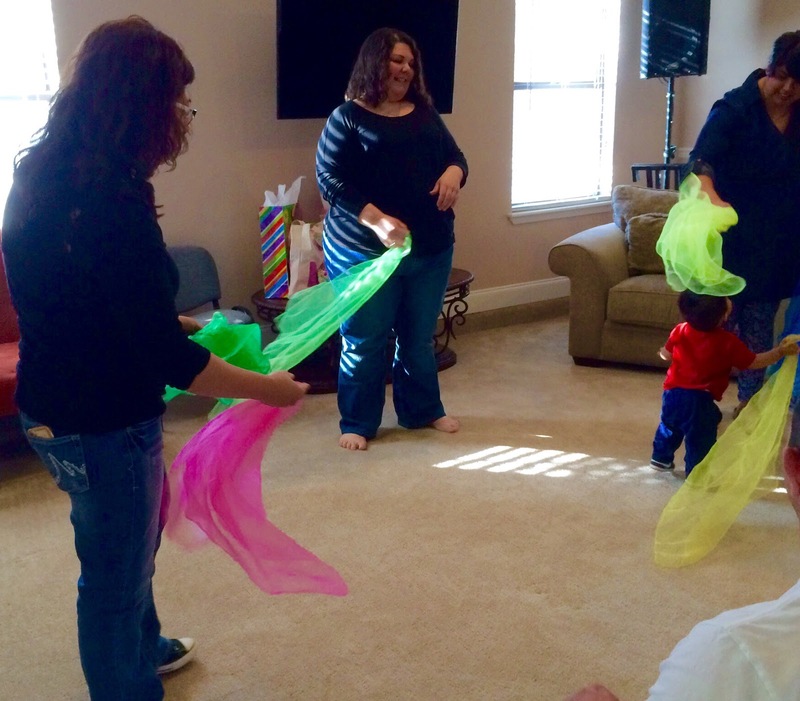 Baby Music of Abilene is one of only eight Suzuki Early Childhood programs in the state of Texas. We are so proud of this program established four years ago. We traveled far and trained long to learn the special curriculum for YOUR baby, birth to four years. Every week we include activities such as those pictured below. Each student has the opportunity to play instruments of high quality, to learn useful skills such as counting, pre-reading, and listening. Social skills practiced every week include taking turns, listening to and encouraging one another, politely greeting each one in the class, quieting oneself, and much more! Moms learn to be more creative and to better observe their children. 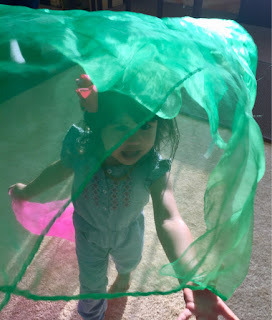 Activities vary from quiet to exciting to copying to creating to quiet. Twice a year we share our skills with an audience. In Spring we participate in a recital. At Christmas we share at a retirement center. 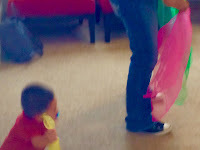 The Lollipop drum is a weekly popular activity! We listen, play and become creative. The happy ending to every class includes reading specially chosen books. We choose them for their illustrations as well as the story, rhythm of the language and vocabulary. 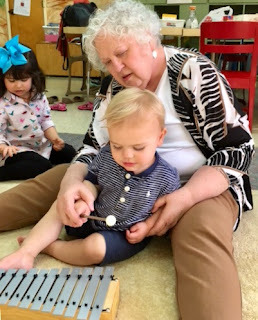 Listening and demonstrating that we hear and can create the high and low pitches on a high quality, beautifully tuned glockenspiel is a fun and favorite part of each week's curriculum. The solos are shared each week. Sometimes, not EVERYONE gets a turn. Important to learn! CHECK OUR FACEBOOK PAGE, Baby Music of Abilene. MESSAGE US FOR MORE INFORMATION ABOUT TIME/PLACE/TUITION. Caitlin and Mrs. Joyce had a "First" experience while Princess O had a First Birthday. 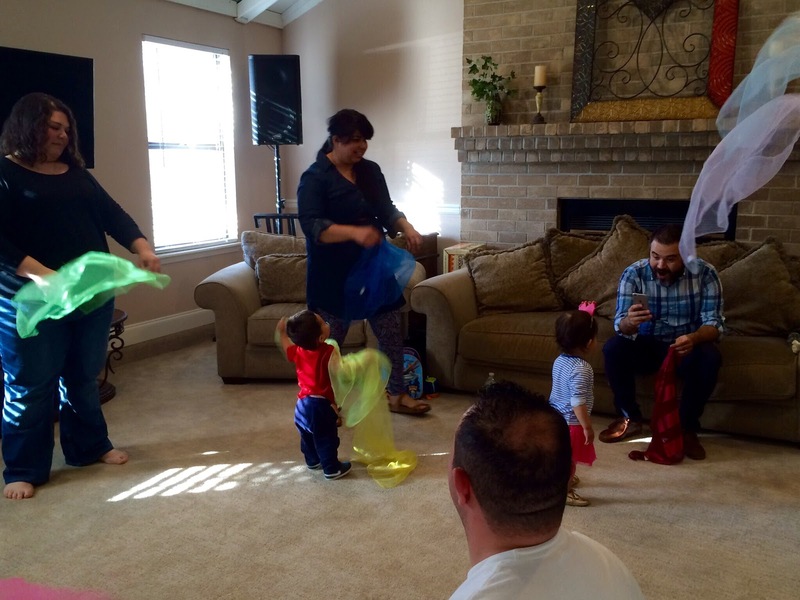 We had never even thought about having an Early Childhood Education Suzuki party, but Miss O's Mom did! And she was the hostess with the mostest providing baked potatoes and all the trimmings. Four adorable boys experienced their first class with us and Miss O showed them how to do it all. We were very impressed with their dancing and listening skills. 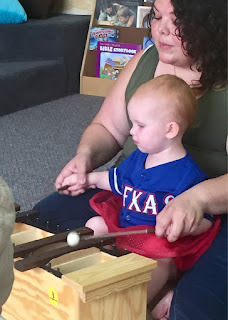 After playing the rain stick, triangle, and glockenspiel there was no one making a sound or moving in the entire room. 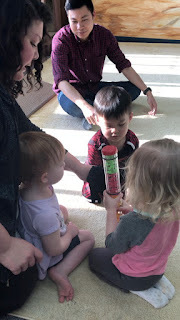 After we read "Hand, Hand, Fingers, Thumb" with the lollipop drum providing a steady beat to enhance the rhythm, there was also complete silence. Even the most introverted of them all was saying "Spider" when we packed up. Join us for class on Thursday evening at 5:45 pm. Call 325-829-4440 for more information about location and tuition. Thursday, January 14 we begin the new semester. We are excited to see you again, looking forward to teaching you new skills and to seeing all the new skills you have learned through the Christmas break. We will begin promptly at 5:45 pm with a quiet time of rolling the ball. What a hit we were at Royal Estates before Christmas! In the photos above you can see the crowd beginning to gather around. The evening was so successful as a class (First time for Miss O to go a glissando and first time for Mr. W to volunteer to play glockenspiel) and as a performance for the residents. So many of them asked about you as we left the building and were greatly blessed to see you learning to sing and play. NEW SEMESTER BEGINS THURSDAY, JANUARY 7, 5:45 PM AT MRS. JOYCE'S STUDIO. BRING YOUR FRIENDS AND JOIN US FOR AN HOUR OF LEARNING AND FUN. "New" Findings in Brain Development: Music study is IMPORTANT! Notice that this study found that even a very early level of study will affect brain development for many years. Today I attended the All Region (16) Orchestra concert and was so blessed and encouraged to hear the guest conductor point out to the audience that studying music boosts focus of attention, all manner and level of listening and motor skills, good manners, and especially (drum roll please) teaches students to follow through to completion and a high level of mastery the task set before them! Enough said! Everyone knows we can train the body with exercise. Did you know you can train your brain with music? Did you know that you are not only learning to play an instrument, sing, or read music but additionally growing emotionally and behaviorally? This Washington Post article explains an MRI study of children who study music. Every Suzuki Early Childhood class teaches and practices behavioral skills (taking turns, developing patience, showing respect, etc.). Every class has opportunities to express joy, honor, and polite assistance. Come join us at Baby Music of Abilene! With temperatures barely in the 30's perhaps we should call this Bleak Midwinter Semester, 2015. Tonight was our first class of the new semester and we had a new/old friend return for class, Mr. M and Mom. His maturity since we last saw him in class is astonishing and all his efforts to play instruments, sing, and participate in the circle were enthusiastically praised. We especially enjoyed hearing him count ducks and drums and spell "Moo" for the three cows of Ring Around the Rosie. Way to go! Sadly, people were missing tonight due to illnesses and fevers and other reasons, but we hope to see everyone next week at 5:45 or a bit earlier if you can get here. 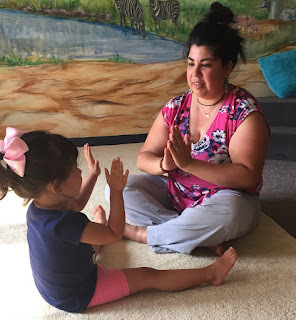 Don't forget that this is one of the few Suzuki Early Childhood classes in the Lone Star State. It is an incredible opportunity to feed little minds, stimulate musical learning, build motor skills, encourage pre-reading skills and so much more. Baby Music of Abilene is committed to helping you learn more about educating your child and being a great parent. Plus, we have FUN! 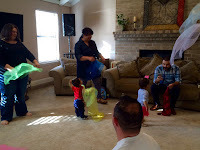 As I mentioned on our FaceBook page (https://www.facebook.com/babymusicabilene?ref=hl) don't ever say there is nothing to do in Abilene with babies and toddlers! We are here weekly, Spring, Summer, and Fall Semesters. Orff Level I Belmont "Take Five"
Wow! And our classes thought 'Scrambled Eggs" was a challenge !